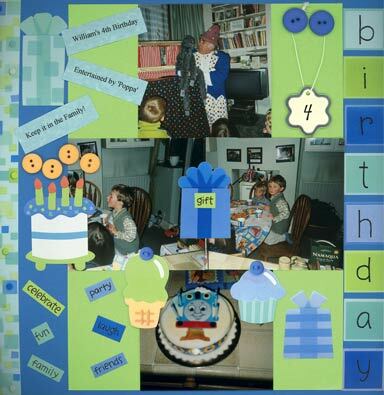 Whether to use scrapbooking borders or not is quite a current topic. I’d be exaggerating if I said it was dividing the world, but a number of scrappers these days are producing layouts with no borders at all, and don’t actually ‘believe’ in them. 2.Use a border template, which you can get in craft stores or you can find some online that you can then print out from your computer. As with free hand, make sure you use an acid-free pen as you begin tracing the borders directly on to your background paper or accent. Find paper that you like – that ‘resonates’ with your photo/s and/or your theme and adhere it with acid and lignin-free glue or archiving tape. 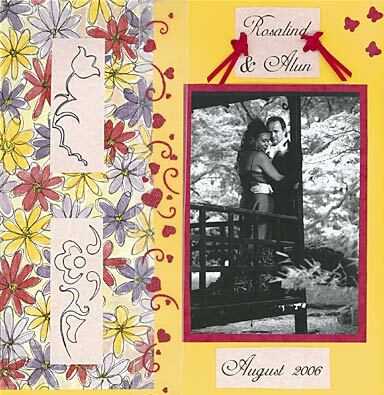 On this wedding scrapbook I got so carried away with my border that I nearly didn’t have space for my photo! Get a bit creative and cut out pictures from magazines, although in the long term the acid content of some magazine print might come back to bite you. You can find pictures that you think could make good scrapbooking page borders and then archive them until you’re making a layout when you can use them. Whether you dispense with borders completely or run with any of the options here, always remember that your border is meant to ‘serve’ your overall layout – NOT the other way round! Enjoy.